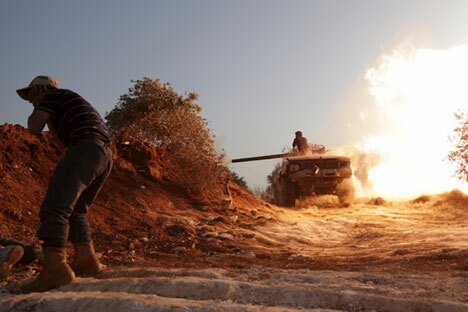 A rebel fighter of the Al-Furqan brigade covers his ears as a fellow fighter fires a vehicle's weapon during what the rebels said is an offensive to take control of the al-Mastouma army base which is controlled by forces loyal to Syria's President Bashar al-Assad near Idlib city May 17, 2015. Russian weapons could prove the key to help stall the rampant march of the Islamic State in Syria. Given the weapons it holds, how should Syria use Russian weapons to its advantage, and perhaps turn the situation on the ground around? With Russia mulling increased advisory assistance and France claiming to have launched air strikes against the Islamic State in Syria, all eyes are poised on what steps President Bashar al-Assad will next take. His choice of strategic objectives will be made on the basis of an analysis of the structure of IS; its rear formations, its supplies and the specifics of tactics it has adopted. Analyses indicate that the IS has turned out to be very vulnerable in ensuring supplies, despite its substantial finances, primarily from contraband crude oil. The rapid expansion of the IS north and northwest has firmly extended its communication systems. According to analysts, to launch a potential operation against IS, the most advantageous and important strategic targets could be the group's rear bases, especially the large POL storages, the frontline repair bases, as well as the columns that supply the fronts with POL and ammunition. The Syrian government army already has sufficient air force hardware to start successfully carrying out such air strikes. Squadrons (12 units) of front-line Su-24 bombers and the same number of Su-25 attack aircraft are adequate, military strategists suggest. This coincides with the number of aircraft, according to sources, that Russia has recently supplied Syria. A few weeks of such air operations are likely to disrupt frontline units of IS in the province of Idlib, around Aleppo, in the suburbs of Damascus and by Deir ez-Zor. During this period, however, as is happening at the moment, heavy fighting will continue on the ground in some critical points. Syrian government forces now face three immediate challenges. The first is to push back IS forces and their allies from the eastern suburbs of Damascus. The second is to relieve the Kuweires base near Aleppo. The third is to take full control of the road leading from Damascus to Homs. Battles in the densely populated eastern suburbs of Damascus assumed the character of war of extermination around a month ago when government forces unsuccessfully attempted a counterattack. This region will thus constitute the core of a concerted counterattack towards the Palmyra region, which basically could reverse the course of military operations against IS in Syria. IS has deployed and concentrated its most capable forces in these neighborhoods, making it imperative for government forces to outnumber the enemy if they wish to be effective. Modern Russian weaponry, including T-90 tanks, could be supplied for this purpose to this region. However, this superiority in numbers may not be enough to attack Palmyra swiftly, in an organized manner. Between the Damascus and Palmyra suburbs is a barren desert with only a few roads and strategic crossroads. The only point of support here is the al-Kartyain oasis, where paratroopers could ideally land and cut off the large number of IS forces concentrated in the suburbs of Damascus. Such an operation would be possible only with landing resources, such as transportation aircraft, helicopters and special armored vehicles. The Kuweires air force base has been under siege for almost three years but, until recently, its garrison received supplies. It is possible that strengthening the air power and providing government troops at Aleppo more modern armoured vehicles would create an opportunity to relieve the base which, in turn, would help government troops to start pushing IS out into the desert. The strategic Damascus-Homs route is currently severed in two points. And although it is still possible to go around the first problematic point (about three kilometres), IS has captured several dominant heights at the second point. Driving the IS out of those areas without artillery and helicopters will be difficult and would involve substantial losses, military strategists pointed out.